On the third Monday of January, we honor Martin Luther King, Jr. King’s legacy is most clearly and publicly embodied in The King Center in Atlanta: The Martin Luther King Center for Nonviolent Social Change. 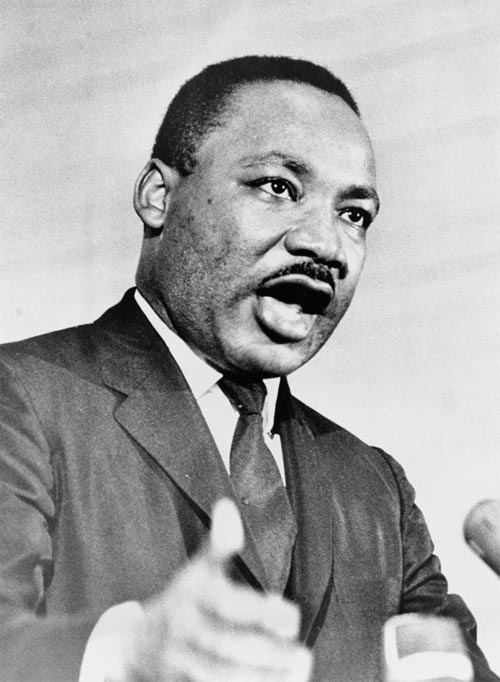 It’s not the center for civil rights; it’s not the center for advancement of minorities; it’s not the center for anti-racism and multiculturalism; it’s not the center for civil disobedience; or even the center for justice – though King stood for all of those. It’s the center for nonviolent social change. In honoring the work and the heart of this human being today, I want to look at this idea of Nonviolent Social Change. Building from King’s life and work, what have we learned since his time? King had a dream of peace and justice. Are there resources available to us that weren't available to him for realizing that dream? In the years just before and just after Martin Luther King's death in 1968, the Unitarian Universalist efforts to address racial justice tore us apart. We were, and are, proud of our presence and support in Selma in 1965. Five hundred Unitarian Universalists participated with Dr. King in that march from Selma to Montgomery, including over 140 Unitarian Universalist clergy -- 20 percent of all UU ministers in final fellowship at that time. We seemed -- to ourselves -- so clearly to be on the "right" side. The line between us (the good guys) and them (the racists) seemed well-established. Then, in 1967, 135 UUs came to New York for an "Emergency Conference on Unitarian Universalist Response to the Black Rebellion." Almost as soon as the meeting was called to order, 30 of the 37 African American delegates withdrew to form a Black Unitarian Universalist Caucus (BUUC). They developed a list of what they called "non-negotiable demands" to be submitted to the conference and, ultimately, the UU Association's Board of Trustees. The core demand was that the board establish a Black Affairs Council (BAC), to be appointed by the BUUC and funded for four years at $250,000 a year -- which would have then been 12 percent of the UUA's entire budget. The next General Assembly approved these demands. Then the General Assembly after that, finding that funds had grown tighter, wanted to spread the million dollars over five years at $200,000 a year instead of four years at $250,000 a year. The BUUC seemed heavy-handed to some, and another group, "Black and White Action" (BAWA), formed -- also sincerely wanting to advance the cause of civil rights. Very hard feelings erupted on the floor of the General Assembly 1969 in Boston. Almost all of the 200-300 black delegates there got up and walked out. The BUUC folks denounced the BAWA folks. Our denomination, over 42 years later, is still struggling to come to terms with the events of that General Assembly and the issues raised. Yes, it seems the leadership of the UUA had some paternalistic civil rights attitudes. And, yes, the BUUC leaders might have chosen to be content with recognition and funding and not vindictively insisted on "not one penny for BAWA." And, too, the BAWA supporters might not have reacted against the BUUC as if their lives depended on it. As I read the accounts about that awful fighting, it almost makes me cry. We so wanted to fight for justice. And we so didn't know how. We didn't have the skills, the resources, to hear each other with compassion. Do we now? It is with our specific Unitarian Universalist history in mind that I ask this question: are there resources for nonviolent social change -- for hearing each other in compassion -- that weren't available in King's time? On the day when King would have been celebrating his 83rd birthday, and almost 44 years since his death, how stand the prospects for nonviolent social change? As we gather here for worship today, hoping to open our hearts to an experience of something that some of us call sacred, I know we bring with us our awareness of this unique moment in history. This time when Time magazine’s person of the year was “The Protestor” – when the Arab spring toppled regimes in Egypt, Tunisia, Libya, and appears possibly on the verge of bringing regime change in several other countries – this time when, in recent months, we have seen the Occupy Wall Street movement spread across the country and to other countries – what now have we learned, are we learning, about nonviolent social change? The collective composite person Time calls “The Protestor” has sometimes been quite violent this last year – yet the influence of the nonviolent ideal can also be seen at work, both in the Middle East and in our Occupy movement. This is also a time when, this week, we learned about a video of US marines urinating on the bodies of dead enemy fighters. A much less publicized story I also came across this week is that another video has emerged that shows a soldier beating a sheep apparently to death with a baseball bat to the whoops and laughter of other soldiers looking on. That article also mentioned that last year a video appeared that shows a US marine throwing a puppy off a cliff. Oh, my. I would have liked us – us as a species – to have that not included in our accounting of ourselves on Dr. King’s 83rd birthday. But what if the plan was that we would do better? OK, the plan is that we do better – and videos like these show some of us not doing better. I don’t bring this up just to bemoan the fact. I mention these videos because they, and the reaction to them, tell us something about the nature of violence and nonviolence. The news coverage about the desecration of bodies also covers the attention it’s getting. We see that the Afghans, all the US military and political leaders, and, indeed, the world community all condemn this act. We are all horrified and appalled. Why? Why do we think it’s OK to shoot people – but certain things done to their bodies when they themselves are beyond caring are off limits? How could being urinated on be worse than being shot dead? We react the way we do, I believe, because at a visceral level we recognize an important truth. The essence of violence is in the heart. The essence of violence is in the heart. Bombing people, shooting people, gassing, stabbing, clubbing, hitting, and torturing people are not the core of what violence is. Those things are merely the manifestations of a heart that is disconnected. We are shocked – rightfully shocked – by desecration because it reveals to us an essence of violence – a dehumanizing hatred behind the shooting and killing – an essence that we had preferred to pretend wasn’t there. But, of course, it is there. Young men in their teens and twenties are not the most serenely wise demographic to begin with, and when you throw them into nerve-racking battle for months at a time, when you ask them to fight and kill and be in harm’s way, they are going to find hating and dehumanizing expedient for the task. So desecrating enemy bodies is as old as war. Its shock value is part of the conscious or unconscious strategy to demoralize the enemy side and harden our own side to be able to keep up the killing. What this latest episode reminds us is that nonviolence is not merely refraining from shooting, stabbing, clubbing, kicking or hitting others – as important a step as that is. Nonviolence is a heart committed to softening instead of hardening. Nonviolence is a heart that loves, that respects, that reveres life, that connects and wants to connect. And we are violent to each other – whether we ever raise a hand or raise our voice to each other – whenever we fail to respond to each other out of reverence for the wonder of the life that is before us. The heroes of nonviolence pictured on the right -- Mohandas Gandhi, Martin Luther King, Aung San Su Kyi – weren’t just effective political organizers who happened to tell their followers, "Oh, and, by the way, no hitting." They were at the forefront of social change that we call nonviolent because they understood that the essence of violence is in the heart. Each of these three was or is deeply grounded in a religious tradition. So who is that guy in the fourth picture? That’s a man whose work is not confronting political regimes, doesn’t give rousing speeches at political rallies, or organize marches, boycotts, sit-ins, or hunger strikes. Yet his work treats of the essence of violence and nonviolence, and it paves the way for profound social change. 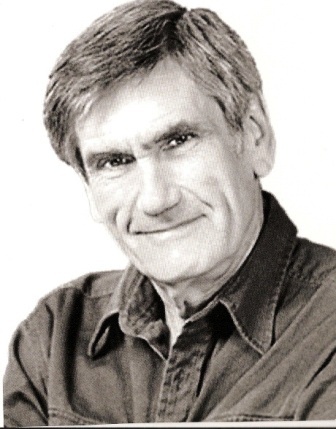 He is psychologist Marshall Rosenberg, the developer of nonviolent communication and the founder of the center for nonviolent communication. Rosenberg has outlined a simple – deceptively simple, for it is very challenging -- four-step process for both speaking and listening. To learn and implement nonviolent communication takes both a lot of desire to address the violence in our hearts and in our relationships, and also a lot of skill. It doesn’t seem that complicated or hard. Our lives subject us to stresses and conflicts – and while I hope that for you they are a much milder form than what our soldiers are subjected to – we respond with an analogous form of heart-hardening that is no easy matter to train out of us. These are subtle skills. It’s no wonder that our Gandhis, our Martin Luther Kings, our Aung San Suu Kyis have been so rare in human history. The extensive spiritual training and depth they each had allowed their hearts to soften and become wise enough to lead their heads. 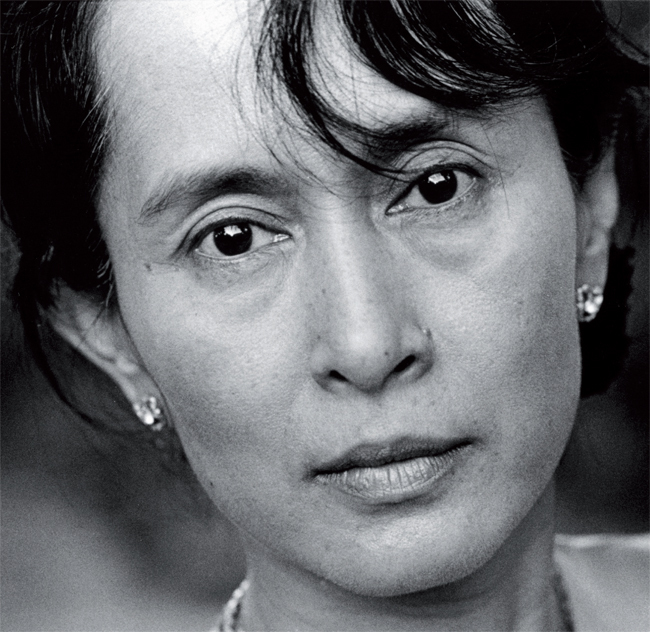 The world, is full of Hindus, Christians, Buddhists, Muslims, Unitarian Universalists, and others whose hearts are not where Gandhi’s, King’s, and Suu Kyi’s were or are. The teachings of a faith tradition alone don’t magically make it happen. It also takes deep commitment to the vision the teachings point to. Otherwise folks hear the teachings, nod, and proceed to largely ignore them. I am so prone to that myself. When I am studying or hearing the important teachings about peace, justice, loving-kindness, I have to remind myself over and over – yes, I may want to try to offer this teaching to others, for that is a role my calling includes, but first and primarily, it is for me. It would be nice if I would learn this. I pray for courage to remember that that’s always first. The four-step process – observation, feeling, need, request – is one more teaching to nod at and forget – one more thing for us to wish other people would learn – unless our hearts truly yearn for the vision this teaching points to. The vision is creating a quality of connection among people that supports getting needs met through natural giving. The vision is a focus on two questions: what is alive in me and alive in you – and how can we contribute to making our lives wonderful. There are resources available to us that weren’t available in Martin Luther King’s time for realizing his dream of peace and justice – and the resources of the teachings and methods and commitments of Marshall Rosenberg and his team at the Center for Nonviolent Communication are, to my mind, the most significant, and the most promising hope for nonviolent social change. There is much to learn here – a lot to take in and practice and internalize – that I can’t go into today. and order the first and primary text of Nonviolent Communication here. “I was working with a team of minority citizens who wanted to change hiring practices in the health services department of the city of San Francisco. These citizens felt that the hiring practices were oppressive because they discriminated against certain people. They wanted me to show them how Nonviolent Communication could be helpful to them in getting their needs better met. For three days I showed them the process and how it could be used – and then they were to go out that afternoon and come back the next morning, and we would see how it went. The team of six of them had gone into an administrator’s office, and they told me how they had used Nonviolent Communication very well. They hadn’t gone in and diagnosed the system as oppressive. Rather, first they had made a real clear observation of what was going on. They identified the law that they felt was discriminatory because it didn’t allow for the hiring of certain people. Second, they expressed their feelings, how painful it was for them because they needed work and equality. They believed they could do this work, and it was painful for them to be excluded. They made a clear request of the administrator, saying exactly how they would like to see the hiring practices changed to better allow for them to be hired. They told me how they said it, and I was very pleased. They incorporated beautifully the training we had gone through. They had stated clearly what their needs were, what their requests were, and they didn’t use insulting language. They forgot to see his humanness because he is within a structure. And within the structure he was speaking structure language, not human language. As Walter Wink points out, organizations, structures, and governments have their own spirituality. And within those environments people communicate in a way that supports that spirituality. Nonviolent Communication shows us a way, no matter what the structure, to cut through it and see the human being within it. I could see that I hadn’t trained them well enough on how to do that, so we practiced. We practiced how to hear the needs behind all that bureaucratic language, how to see the human being and make a connection that strengthens our ability to work toward social change with that person. After our training at that level, they made another appointment with this man. And they came back the next morning delighted. When they saw what was behind his messages, they saw that he was scared. He actually shared their needs – he didn’t like to see how this law was discriminatory – but he had another need: to protect himself. And he knew that his boss would be very upset with this suggestion, because his boss was vehemently opposed to what they were after. He had a need to protect himself, and didn’t want to go to the boss and help them make the change. Once this team of citizens saw what his needs were, they worked together, but in a way that got everybody’s needs met. What happened is that he mentored them. He led them through what they would need to go through to get what they wanted, and they met his need by protecting him, by not letting anybody know that he was mentoring them. Eventually, they all got the change in the structure that they wanted. Last night at the Unitarian Universalist Fellowship we had a gathering and dinner to welcome prospective members. I was fielding questions. One of the questions was, "Are you an optimist or a pessimist about the way the world is going?" I don’t know which to be. There is so much in the bud that seems so promising. And then, every week the news brings some further reason also to despair of our species. I am in awe of what we have learned, and almost simultaneously have the sinking feeling that we haven’t learned anything. So I make no predictions. Instead, I am hopeful. The plan, as Mary Oliver intimated, is that we do better. God’s plan, the plan for which the divine spark in our hearts is trying to shine us the way, is for connection, for equally caring for everyone’s needs, for self-understanding and compassion beyond judgments of right-doing and wrong-doing. I don’t know if this nonviolent social change will happen, but I know that it could. And I know that if it does – if we shall overcome -- it will happen one heart at a time. Let it begin with me. Let it begin with us. Let it begin right now.